Last week, for the sake of completeness, I took you on a tour of Safari—an application that you likely used to read the lesson. This week we’ll dig deeper and explore some of Safari’s most important preferences. To begin, choose Safari > Preferences. Default web browser: Much as Apple would prefer that Safari launches whenever you click a link outside the browser, you can choose another browser such as Chrome or Firefox as the default instead. To do that, click the Default web browser pop-up menu. If you’ve installed another browser, its name should appear in the list. If it doesn’t, choose Select and then navigate to the browser you wish to use and click the Select button. Default search engine: Safari uses Google by default for Web searches. But you can change that default to Bing or Yahoo by clicking this pop-up menu. Safari opens with: Safari under Mountain Lion remembers the tabs and windows that were open when you last quit the browser. If you like, you can have those views saved and then opened when you next launch Safari. To do that, choose All windows from last session from this pop-up menu. Otherwise, Safari will open with a new window. New windows open with: From this pop-up menu, you choose what Safari displays when you open a new window (or one is opened for you when you first launch it). By default you’re taken to Apple’s website, which is a nice bit of advertising for the company but may not be something you wish to see. If you choose Top Sites, you’ll see a grid that displays thumbnails of sites you visit frequently (or have just recently visited). Homepage takes you to the site entered in the Homepage field below, Empty Page displays a blank page with no Web address, Same Page displays the same page you have open in another window, and Bookmarks shows the page you’d see if you clicked the Bookmarks icon in Safari’s toolbar. New tabs open with: The choices here match those found in the ‘New windows open with’ pop-up menu. Homepage: If you’d like Safari to open to your Facebook page or your third-cousin’s blog, just enter that address in this field and choose Homepage from the New windows open with menu. Or, if you just can’t decide, cruise around the Web for awhile, and when you find a destination you like, click the Set to Current Page button. Remove history items: Safari will, by default, keep track of the sites you’ve visited. It stores this information in its history. You can choose to delete this history at particular intervals—after a year, month, two weeks, one week, or a day. If you like, you can instead choose Manually and issue a command to empty it (something I’ll show you how to do in next week’s lesson). Configure the default Web browser, windows, and tabs in the General preference. Save downloaded files to: By default, Safari saves downloaded files to the Downloads folder, which you’ll find in your user folder. But you can ask Safari to download these files to any folder you like. Just click the menu and choose Select. In the sheet that appears, navigate to a folder you find more convenient and click Select. Remove download list items: If you’d prefer that others using your account not see what you’ve downloaded (or if you’re a tidy person), you can choose to have items in the download list removed. This doesn’t throw away these items, it only removes them from the list—they remain in the Downloads folder (or wherever you’ve chosen to store these things). By default, you remove items by clicking the Downloads button at the top-right of the Safari window and then clicking Clear in the resulting menu. But you can instead choose When Safari Quits or Upon Successful Download from this menu, and Safari will follow your orders. Open “safe” files after downloading: Safari has a good sense of which file types are naughty and which are nice. (Meaning which can be potentially malicious.) Check this option, and the nice files will open without your having to issue a command or double-click a file. If you’re not using tabs—Safari’s way to open and access multiple webpages within a single window—now’s the time to start. Do so by choosing View > Show Tab Bar. Now let’s see how you can configure those tabs with Safari’s preferences. Open pages in tabs Instead of windows: The main reason to use tabs is to avoid having multiple open windows clutter your screen. This setting helps in that it determines when tabs should appear. The default Automatically setting means that Safari will make every attempt to open a new site in a tab rather than a window. You can optionally choose to have new pages never or always appear in tabs. Tabs are a great tool for more efficient browsing. Command-click opens a link in a new tab: The meaning here is clear. I point it out simply to suggest that you learn this helpful shortcut. When a new tab or window opens, make it active: This preference is turned off by default and I leave it that way. I occasionally open multiple links within a page for later browsing by using the Command-key shortcut I just mentioned. If I enabled this option, I’d routinely be taken to the linked page in an active tab. I’d rather browse these tabs later. 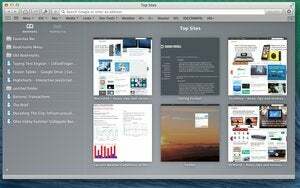 Among Safari’s talents is the ability to fill in Web forms with particular kinds of information. With the current version of Safari, this includes your contact information (name, address, and phone number), names and passwords, and other form information (a customer number, for example). Within this preference, you can disable some of these options as well as edit them. For instance, if when autofilling a form with your contact information you find that something is wrong—it’s using an old address, say, or some information is missing—click the Edit button in this preference to open your personal contact card in the Contacts application. Edit the contact to include the correct and complete information that autofill lacks. Click the Edit button following ‘User names and passwords’, and you can choose to remove or expose selected passwords (something we’ll look at next). And if you click Edit next to the ‘Other forms’ option, you can choose to remove stored information for particular websites.